Srinagar, Apr 12: Two youth were killed and six others injured as Army allegedly opened firing on angry protesters in Handwara town of North Kashmir’s Kupwara district this afternoon who were protesting against the alleged molestation bid by a trooper and tried to put an Army bunker on fire and ransack it. Expressing grief over the killing of two youth at Handwara, Chief Minister, Mehbooba Mufti today said the forces personnel involved in the incident would be handed exemplary punishment. Mehbooba said that she has already taken up the matter with the Army. “The Chief Minister talked to the GOC-in-C, Northern Command, Lt Gen D S Hooda, who informed her that the Army has already ordered an inquiry into the incident and tangible action will be taken once the probe is completed”, said an official statement. Mehbooba said the security forces must exercise maximum restraint and adhere to the Standing Operating Procedure (SOP) while dealing with the public protests as incidents of innocent killings cannot be tolerated. She expressed solidarity with the families of the two youth. Chief Minister said such tragic incidents have a huge negative impact on the efforts of the State Government and the political leadership aimed at consolidating the peace efforts in the State. “Regarding the demand of the locals for shifting of the bunker from the area, the Army Commander assured the Chief Minister that the demand would be looked into”, the official statement said. Inspector General of Police, Kashmir range, SJM Gillani while giving details told Excelsior that there was an allegation of misbehavior against a security force personnel with a girl and a mob gathered there and tried to set afire the Army bunker and ransack it. “In retaliation, the troops fired at the mob in which two men were injured and later they succumbed to injuries. We are investigating the matter and for the time being we are trying to control the law and order situation”, he said. A Police spokesman said here: “Today afternoon an alleged incident of misbehaviour with molestation of a girl by an Army man took place in Handwara town. Within minutes public in large numbers gathered there and attacked the Army bunker in Handwara Chowk. They assaulted the personnel deployed there, ransacked the bunker and attempted to set on fire the bunker etc”, he said. “In retaliation the security forces deployed used force to disperse the violent rampaging mob. In the process two individuals namely Mohammad Iqbal R/o Bomhama, Kupwara and Nayeem Qadir Bhat S/o Gh. Qadir Bhat R/o Banday Mohalla, Handwara, sustained fire-arm injuries. They were evacuated to hospital where they, unfortunately, succumbed to their injuries”, said the spokesman. The police spokesman said that a case has been registered and investigations have been started. “J&K Police deeply regrets the loss of life. A criminal case has been registered in Police Station Handwara and investigation launched to ascertain the facts”, he added. In the meantime, the girl who was allegedly molested has denied that she was molested. A video released here on social networking sites says that she went to a nearby washroom along with her friend. She said that a youth came and he grabbed her bag. She said immediately more youth came who were part of conspiracy and resorted to slogan shouting. Reports said that massive protests erupted in Handwara town after an army trooper from 21 Rashtriya Rifles allegedly attempted to molest a girl student of Handwara secondary school. As soon as the news spread in the town, scores of youths including students staged massive protest and resorted to heavy stone pelting on an Army bunker in the Town. As the clashes turned violent in the area, and the Army bunker which is in the main chowk of the town was encircled by mob, Army opened fire to disperse the protesting youth. Three youth received bullet injuries. They were immediately shifted to District Hospital Handwara where Nayeem Ahmad Bhat son of Ghulam Qadir Bhat of Heerpora, Handwara succumbed to injuries. Another critically injured youth Mohammad Iqbal, son of Farooq Mir, resident of Shalpora village of Drugmulla, Kupwara was shifted to a Srinagar hospital but he too succumbed to injuries. 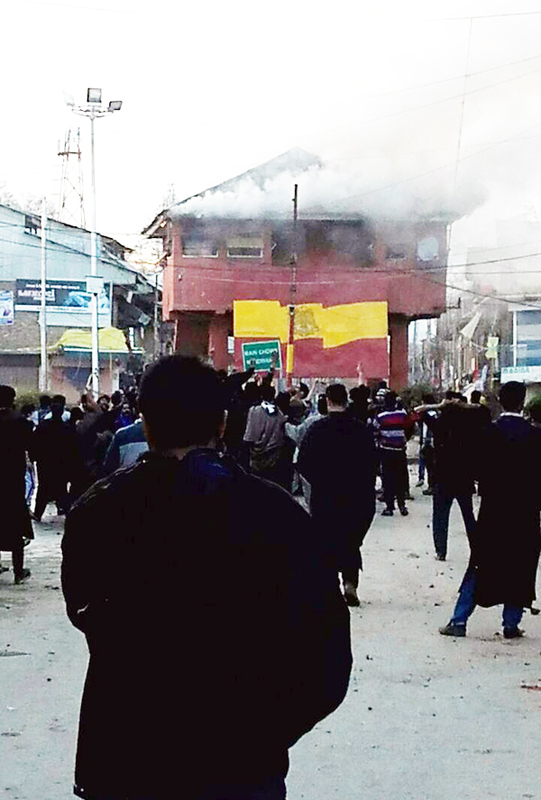 Following the killings, hundreds of youths took to streets in Handwara and staged violent protests. The youths again resorted to stone pelting on Army bunker at Handwara town. The bunker was set on fire and also vandalized. As the clashes turned intense, a heavy contingent of police and CRPF arrived in the Handwara town to control the situation. The youth later clashed with the police who retaliated by firing dozens of teargas shells. The clashes later spread to adjoining Kupwara and Langate areas where hundreds of people took to streets and held violent protests. At least nine Army men were trapped inside the bunker as they were surrounded by a mob and they were trying to set ablaze the bunker. However, these Army men were later rescued. Nine persons including a woman, Jana Begum, who was hit by a stray bullet sustained injuries. The woman along with some other critically injured persons was shifted to Srinagar for treatment. Medical Superintendent Sub district hospital Handwara, Dr Abdul Rouf said that a woman, Raja Begum, in her fifties, wife of Mohammad Jamal Mir, was admitted into the hospital after she was hit by bullets. She has been shifted to Srinagar. A police official said that Raja Begum was in her vegetable garden in Kargam village, 2-km from Handwara town, when a stray bullet hit her as protests were going on in Handwara town. The separatists have called for a shutdown tomorrow against the killings while authorities have decided to impose curfew like restrictions in Old City and Maisuma. Hurriyat (G) chairman Syed Ali Shah Geelani, Hurriyat (M) chairman Mirwaiz Umar Farooq and Jammu and Kashmir Liberation Front (JKLF) chief Mohammad Yasin Malik while condemning the killings have called for Kashmir Bandh tomorrow. Following the shutdown call, the authorities have decided to impose restrictions in Srinagar areas falling under six police stations including MR Gunj, Nowhatta, Khanyar, Rainawari, Maisuma and Safa Kadal. The authorities already imposed restrictions in Kupwara and Handwara.